An injured man reacts at a site hit by airstrikes in the rebel-held area of Aleppo's Bustan al-Qasr, Syria, April 29, 2016. 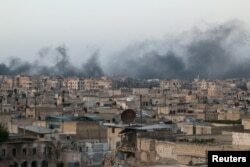 Fighting between Syrian rebels and forces loyal to President Bashar al-Assad spread throughout the war-torn country Friday as Syrian government and Russian warplanes maintained their airstrikes on the former commercial capital, Aleppo, for the eighth straight day. The Syrian Coalition, the Western-favored political opposition to Assad, accused his government of war crimes with the bombing raids on rebel districts in Aleppo, saying the airstrikes "represent a coup de grace" to the U.S.-Russian brokered cessation of hostilities, which was agreed to in February. In Aleppo, a clinic was hit Friday in an airstrike a day after a bombing raid destroyed a hospital, civil defense officials said. The clinic, which had been providing treatment for patients with chronic illnesses and dental services for about five years, was badly damaged. A nurse was among several people wounded. On Wednesday, al-Quds Hospital in the rebel-held Sukkari district was destroyed in airstrikes. U.S. Secretary of State John Kerry said the attack on the hospital appeared to have been "deliberate." On Friday, Médecins Sans Frontières (or Doctors Without Borders) — one of the medical charities that supported the hospital — raised the death toll, saying 50 people died at al-Quds, including 14 medical staff. Children look out from a balcony at a site hit by airstrikes in the rebel-held area of Aleppo's Bustan al-Qasr, Syria, April 29, 2016. The International Committee of the Red Cross denounced the attack on al-Quds, saying it was "unacceptable" and warned that Aleppo was being "pushed further to the brink of humanitarian disaster." Among the medical staff killed at al-Quds was Aleppo's last remaining pediatrician, Muhammad Waseem Moaz. In a Facebook tribute to the 36-year-old, a colleague, Dr. Hatem, the director of the Children's Hospital in Aleppo, praised Moaz's "humanity and bravery," saying, "he was the loveliest doctor in our hospital." Thursday was the deadliest day in Aleppo since violence flared last week, leaving 54 people dead, according to the Syrian Observatory for Human Rights, a pro-opposition monitoring group. The observatory said 226 civilians — including more than 50 women and children — have been killed so far in the eight days of heavy bombardment of Aleppo. "The planes didn't sleep and didn't let us sleep either," a resident told the French news agency. "The Earth is shaking beneath our feet." Friday prayers were suspended at city mosques in rebel-held neighborhoods in fear of more violence. In retaliation for the airstrikes, rebels fired mortars and rudimentary rockets on government-controlled parts of Aleppo. Syrian state media reported Friday that rebels shelled an Aleppo mosque in the Bab al-Faraj neighborhood, killing at least 15 and wounding 30. Aleppo wasn't alone Friday in being rocked by the breakdown in the cessation of hostilities. Renewed fighting was widespread across the country with the rebels and government trading shells in Hama, the regime bombarding villages in southern Idlib just to the west of Aleppo, and fierce clashes reported by activists in the Homs countryside. U.N. rights chief Zeid Ra'ad Al Hussein said in a statement Friday that the renewed violence in Syria this week showed a "monstrous disregard for civilians' lives by all parties to the conflict." A civilian evacuates a baby from a site hit by airstrikes in the rebel-held area of Aleppo's al-Fardous district, Syria, April 29, 2016. Activists also reported clashes between Islamic rebel factions and regime forces in the areas of Al-Bilaliyah, Bala and Al-Bahariyah in Eastern Ghouta after the regime sought to make advances. Rebel commanders told VOA that Assad forces had shelled al-Skik village in the southern countryside of Idlib and that government helicopters and warplanes struck the town of al-Hbit. On Thursday, the U.N. envoy to Syria, Staffan de Mistura, pleaded with the United States and Russia to intervene "at the highest level" to revive struggling peace talks. He warned a partial truce reached in February was now "barely alive." Rebel leaders said the cease-fire was dead in all but name. Opposition leaders Friday dismissed the idea of resuming their participation in peace talks. The vice president of the Syrian Coalition, Muwaffaq Nyrabiya, said it is impossible to "talk about any political approach to resolving the conflict amidst these barbaric, systematic crimes against the Syrian people." The Russian envoy to the U.N. in Geneva, Alexei Borodavkin, said in Geneva that Washington and Moscow are making a joint effort to halt the fighting in Syria; but, he added, "Only Syrians are capable of finding a way out of the crisis."